This past week has been one long series of ibuprofin tabs and shots of Robitussin. But it’s Friday night, dammit, and Labor Day weekend to boot, so I’m shrugging off the damn virus for a few hours to start digging in the liquor cabinet. This drink caught my attention the moment I read the recipe. Just before I went on vacation, the lovely and talented Lauren Clark of DrinkBoston had a wonderful profile run about her in the Boston Globe. In the photo caption — which doesn’t seem to be there any longer, unless I’m looking in the wrong place — there was a note that Lauren was sipping a drink called a Jaguar at Eastern Standard. Fortunately, I copied and pasted the text, since the caption included the recipe, which sounded really intriguing. Now I’ve finally mixed one up, and intrigue? Hell, that ain’t the half of it. The whopping dose of green Chartreuse made me a bit uncertain at first, but it was a wise move to put myself in the hands of the drink’s creator, Tom Schlesinger-Guidelli. 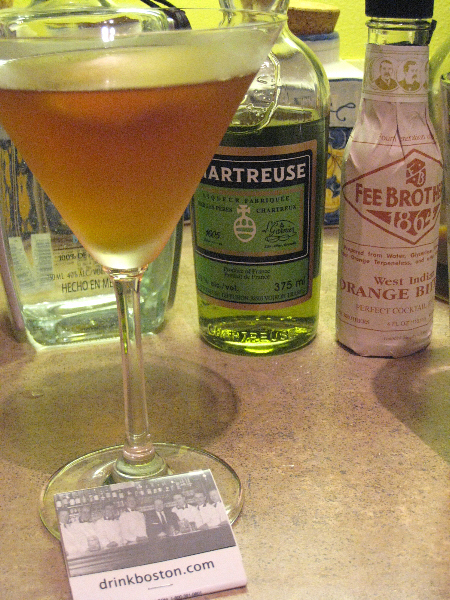 Matched with Amer Picon — I used some of the last of my Picon replica (created by Jamie Boudreau, recipe in July/August issue of Imbibe) — and a nice measure of silver tequila, the Chartreuse fell right into place. This cocktail is really imaginative, and the orangey notes of the amer, bitters and twist give the drink a bright citrusy character, while the tequila’s bite and chartreuse’s herbal mojo give it a lot of complexity. Nice work, Tom, and a belated congrats to Lauren. The Jaguar is a keeper. Stir with ice and strain into chilled cocktail glass; flame an orange twist over the drink. ← Tanned & Rested? Absolutely. Ready? Not quite. Gotta throw this one in the repetoire. Very creative combination of ingredients, and I do love tequilla drinks, especially when there is no juice added to dilute the sting. Great drink, and even better articles in Imbibe. How much longer before you just write the whole damn thing? I had a Jaguar with Jamie’s homemade Picon at Vessel last weekend (and — no kidding — simultaneously smacked my head as soon as I realized that I’d forgotten to tell you we were coming to town). I can’t say for sure that this was the cause of my bleary state the next morning, but I will allow that it was one of the better tequila cocktails I’ve had, outside the usual suspects. Oops, has a whole week gone by without my responding to this?! Paul, thanks for talking up the Jaguar and one of Boston’s best new mixologists, Tom Schlesinger-Guidelli. This drink deserves to be spread around the country, for sure. Lauren — the Jaguar is catching on in Seattle; in addition to Union and Vessel, Murray’s a big fan of it at Zig Zag. You and Tom need to come try them out, for research and quality control reasons, of course.